With great power, comes great responsibility. It’s a cliché line, but one I try to live by and so does Peter Parker. It’s the reason he’s one of my favorite heroes. Another Marvel Cinematic Universe movie has come and gone. This one, was special because of the hero involved. 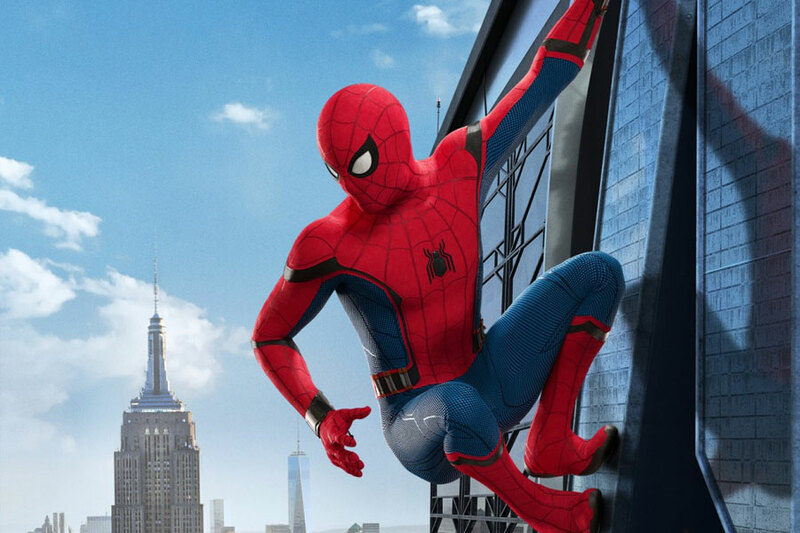 For the first time in cinematic history, Spider-Man is now a part of a shared universe. The possibility of Spidey trying to pick up Thor’s hammer (and maybe succeeding) is very real. So is the possibility of him tag teaming Thanos’ goons with Groot on a different planet. Spider-Man is at his best when he’s able to interact with other heroes. And that’s usually, because he always gets his chance to shine. Who can forget the heartbreaking moment in the Avengers vs. X-Men comic where he attempted to take on two members of the Phoenix five? Using his jokes and wit to take on Colossus and Magik. Broken ribs, shattered nose, it didn’t matter. Spider-Man needed to make sure everyone got out safe and he knew he was the one who could make it happen. It was a truly iconic moment, and Spidey has tons of moments like that. Spider-Man is one of the world’s most popular heroes for a reason. He isn’t a billionaire, he isn’t a super soldier, and he isn’t overcome with melancholy like some heroes. No, Spider-Man, or more correctly, Peter Parker, has one of the best outlooks on life, and not just in comics, in fiction period. The way he uses jokes to manipulate his enemies is classic. He also jokes so much because it’s his way of laughing at life. By joking so much in the face of death, Spider-Man is letting life know, that it will never get him down. It’s a mentality that has earned him the status of one of Marvel’s elites. The thing that makes Spider-Man the best though, is his role in the Marvel Universe. In current comics, it’s different, but for years, ever since his debut in 1962, Spider-Man has been relatable. He’s always wanted to protect the little guy. “Friendly Neighborhood Spider-Man” is a cute saying, but the reason it’s said is because he’s a valued member of the community. People rely on him and they know that if Spidey is coming, the problem will usually be resolved. With minimal damages and casualties. And hey, you may get a picture out of it. Because Spidey loves interacting with people. He loves the attention, sure, who wouldn’t. But there’s something in his brain, in his soul, that makes him love people. He’s a hero for the people in its purest form, and this movie, captured that perfectly. First though, my expectations leading up to this film. The opening of this film threw me off. I knew I was in for a good film after that opening. 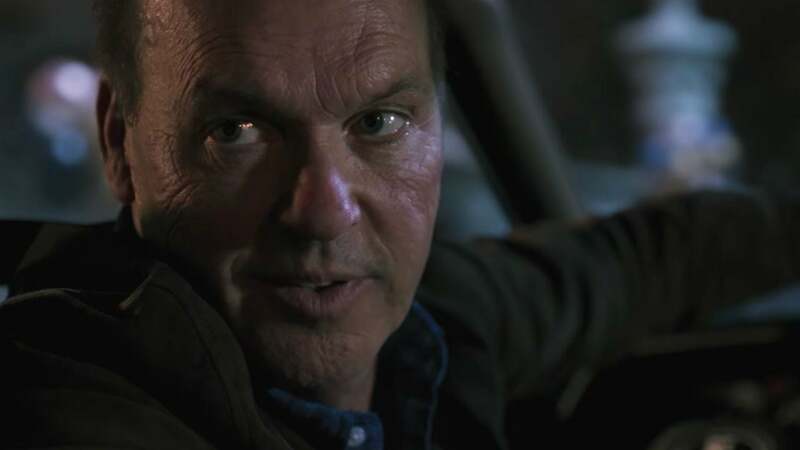 Michael Keaton plays Adrian Toomes in this film. He’s the Vulture. But he isn’t the Vulture when we first see him. He’s a contractor who is in charge of cleaning up the mess from the Avengers film in 2012. I love this because so many people were affected by that battle. Zemo in Civil War had been affected by the events of Avengers 2 and that led to Civil War. Toomes and his crew are forced out by the Deparment of Damage Control. Who is this Department headed by? You guessed it, Tony Stark. Toomes is pissed. But, not in a “It’s time to dismantle the Avengers way.” That’s why this villain works so well. At the site, his crew comes across tons of Chitauri technology. They decide to develop weapons to sell on the black market. Toomes is tired of being crapped on by the government and billionaires who control it all. This technology was his way of setting his own rules, while at the same time, making money. The best villains are somewhat relatable and this was the perfect way to introduce us to him, by making us understand his struggle. The movie then gives us a montage style scene where we follow Peter. We learn that he recorded the events during Civil War. Not to show anybody, but because it was a one in a lifetime opportunity. It was one of the first things that Peter does in this movie, that only a kid would do and I loved it. So, after Civil War, we come into the present and Peter is scratching at the chance to do some Avenger work again. I like this film because while Peter may not know it, and the comedy and light heartedness hides it well, Peter is truly lost for the majority of this film. All he wants to do is prove himself to Tony Stark. We see him swinging around the city, helping out people with simple problems. It’s funny because this is who Spider-Man is, but as I said, he’s blinded by his love of the Avengers and his respect of Tony Stark. A cool moment that showcases this is when Peter goes into his favorite deli to get something to eat. The owner is nice and they have a good relationship. The owner tells Peter he better go to college or he’ll end up like him. Peter responds by saying this seems great. He looks around the shop and has a look of awe on his face. Peter appreciates the little things in life. He appreciates the little people. From the beginning of the film, there was an interesting contrast but similarity between him and Vulture. The film was a bit slow, but that isn’t a negative. I loved how this film took it’s time to establish who Peter is. His relationship with Ned Leeds, his best friend, was highly enjoyable. In my theater, Ned garnered the most laughs. The rest of his classmates were fine too. I wouldn’t have minded seeing them more, but the screen time they got was utilized well. Zendaya played Michelle, who was somewhat of an outsider and she was hilarious. It was clear she had some sort of attraction to Peter but could only conjure up insults whenever around him. High-school is complicated like that sometimes. Liz, Peter’s crush, was probably my least favorite of his classmates. Not even because of her acting, I just wish she was more involved with him as Spider-Man other than just having a crush on him. 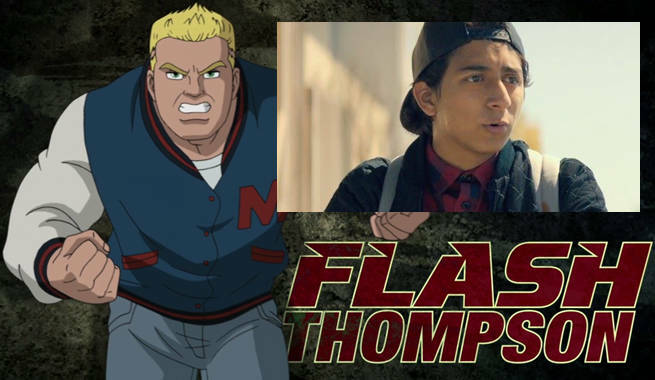 Flash Thompson was your typical bully. I like how he was more of a cyberbully though. Everyone at Peter’s school is smart, but he’s one of the smartest. Peter is extremely insecure though. Girls like him and people like Flash fear him, because of that potential he has. So, like a good bully, he makes sure Peter always feels bad about himself, more so than he usually does. Bullies are more complex than the days of stealing lunch money. All of that introduction in the first act was great. It was also probably the worst part of the film. And that’s saying something. The film picks up when Spider-Man starts to investigate Toomes and the weapons. He comes across the first Shocker dealing weapons to Aaron Davis, who is the Prowler, uncle of Miles Morales, the Ultimate Spider-Man in the comics. Spidey doesn’t handle them well and almost drowns. One of Tony Stark’s suits saves him though and you start to see the first split between mentor and student. Iron Man wasn’t in this film that much at all. I loved this part of the story because it opened the door for Ned to get more screen time and showcase his talents. Peter and Ned use a tracker to see that Toomes’ men are going to Maryland. Earlier in the film, Peter quit his decathlon team in order to focus on being Spider-Man. He rejoins though in order to track down the weapons. One of the best/saddest parts of the film comes up next. Peter and Ned disable the tracker in his suit that Tony put there. They also unlock all of his suits capabilities, which includes his own AI. When Peter is about to sneak out, Liz and the rest of the team are breaking curfew as well, except they aren’t fighting crime, rather going swimming. Liz invites Peter to come. There’s a clear attraction between the two of them, but Peter declines. He is watching from the roof above. The music is sad here as he watches his classmates being normal teens, enjoying life, but he can’t. He wants to, but to stop when he knows people are in danger is as bad as murder to him. He can’t stop helping people, no matter how good of a life Peter Parker seems to have. Spider-Man will always be needed. It was one of the best parts of the film. There wasn’t much action in this film overall. It’s a low point for me, but the action we did get was amazing. 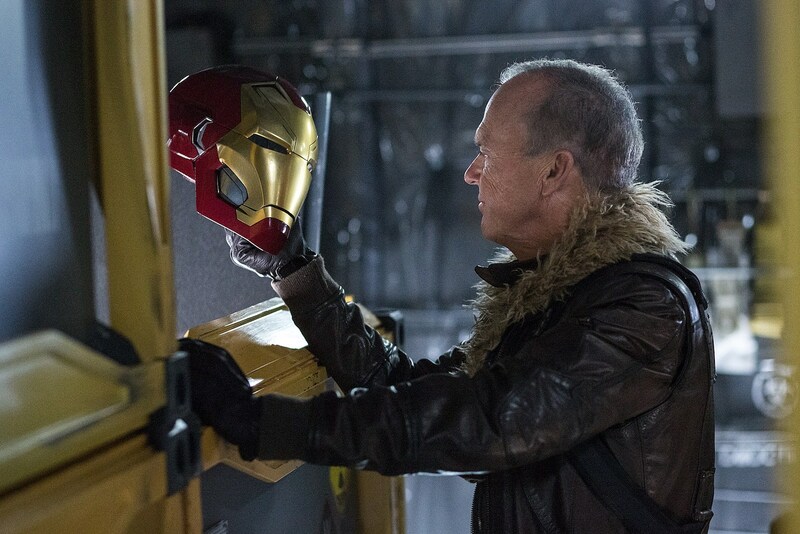 Toomes and crew have been stealing from Damage Control shipments and using it to supply their weapons. Spider-Man engages in a quick fight with Vulture, who’s suit is awesome by the way, but is beaten. Vulture has this cool particle shifter that allows to go through solid objects. He uses it to go into the Damage Control truck. 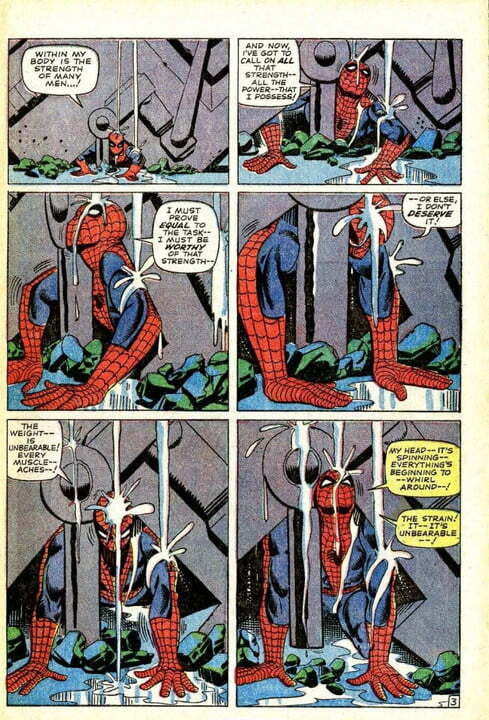 Spidey follows him and when he tries to jump out, he knocks himself unconscious because the portal is gone. When he wakes up, we get a funny scene where he bonds with his AI, that he names Karen. I love this scene because it’s light, it’s funny, and we get to see Peter use his science skills to get out of the warehouse. When he finally does, he also learns that the core Ned has from the weapon earlier in the film, is explosive. Peter already missed the decathlon and shows up just as the core explodes. His friends are trapped in an elevator in the Washington Monument. Peter has to climb the monument, get inside, and save them. This scene is awesome for so many reasons. The main being how well it was shot. I almost got sick when Peter reached the top. It gives you the feeling of really being up that high. I also liked how Peter struggled at points. His powers are incredible, but he does have limits. The climb wore him out and he was almost out of gas by the time he got up there. He eventually saves them though and all is well. Peter is determined though. He interrogates Davis in a hilarious scene. He uses the suits interrogation mode where he sounds like Batman in a way. Davis isn’t fooled though. He eventually gives up the location of Toomes and his men. A ferry. Spider-Man gets to the ferry and starts to take them out. Vulture is there though. Spidey tries to stop one of his weapons, but the core explodes and splits the ferry in half. Spidey works fast to try and save the people on board, but is losing the battle against the ferry. Out of nowhere, Tony Stark shows up in his Iron Man suit and saves the people on board. The whole point of this film is manifested in the next scene. Peter wants nothing more than to be an Avenger. It’s not what his true heart wants, but on the outside, he needs that validation from his childhood hero, Iron Man. Iron Man, with all of his mishaps and guilt from the past 9 years, saw an opportunity in Peter Parker to help someone be better than him. Iron Man is a full-on mentor now. He’s an old man now and has made mistakes. He’s a surrogate father for Peter and scolds him when needed. The ferry incident was Peter’s last chance. Tony takes the suit and tells Peter he’s done. The line that sums up this movie is when Peter is pleading to keep the suit. He tells Tony he’s nothing without it. Tony frowns and says, “If you’re nothing without this suit, then you shouldn’t have it.” Peter goes home and is visibly broken up about it. Aunt May, who isn’t in this film that much, asks him what’s wrong and he says he lost the Stark Internship. Huge tears are in his eyes as he says it and you can feel the pain in his voice. He’s just a kid whose dream was taken from him and the man he idolized, is ashamed of him. I didn’t want to talk about any other superhero films in this review, but it’s needed to understand why I love this film so much. Wonder Woman was a great film. It was funny, but maintained a serious tone throughout and that’s hard to do. The surrounding cast was great and the story was solid. But, it struggled in the third act. Pacing, action, everything was a bit off to me, and it’s the only reason that movie isn’t perfect. Homecoming isn’t perfect either, but it’s third act is incredible. The second act was strong and leaves you a bit sad inside, but this third act brings home the theme of this film. It starts when Peter asks Liz to the Homecoming dance. She accepts and Peter seems to be having a normal life. He goes to her enormous house, rings the doorbell, and who shows up? Adrian Toomes. He’s Liz’s father. This entire scene is so tense, you could hear people breathing in the theater. I was on the edge of my seat. Peter, only being 15, can’t maneuver the situation. His Spider-Man nature kicks in and he can’t stop thinking about the man he knows as Vulture, and the sweetheart he knows as Liz. And it shows. And this film doesn’t treat Vulture like an idiot. Adrian decides to drive Peter and Liz to the dance. This scene is one of the most tense scenes I’ve ever seen in a superhero film. It shows how good of an actor Keaton is, and why he was picked for this role. In the car, he starts to listen and dissect Peter’s voice more. He asks Peter if they’ve ever met. Tom Holland was perfect during this scene as well. His nervousness was clear as day and he didn’t know how to handle himself. It didn’t help that Liz continues to talk and joke about how Peter constantly disappears. Adrian doesn’t need much convincing after that. He tells Liz to go inside when they reach the dance. He tells Peter this is his last chance. He respects Peter because of his drive and is giving him one more chance since he saved Liz in Washington. The threat is received loud and clear as Peter goes into the dance. Another example of why Peter is the best shows up next. He wasn’t in the dance for more than five minutes before he told Liz he had to leave. Vulture just threatened his life, threatened his friends and family. The decision was always easy for Peter. The last part of the film is emotional and action packed. Peter defeats the Shocker with the help of Ned and he confronts Vulture. Vulture baits him though by using his wings to destroy the supports in the building they are in. The building collapses on Peter and Vulture gets away. He’s planning to rob a plane with all types of equipment and weapons that’s leaving from Avengers Tower to the new Avengers facility in upstate New York. This moment in the film made me want to stand up and scream. I have one problem with it though. Well, not really problem, but something that would have made it better. Peter is trapped at the bottom of the rubble. The amount of weight would kill most superheroes on impact. Tom Holland does a fantastic job here crying out for help. His voice cracks multiple times as he cries out in pain. It broke my heart watching this because he was vulnerable. Holland really sold the idea of a fifteen-year-old kid trapped, coming closer to death. There was no Spider-Man confidence. His mask was off and he was in his homemade suit. Peter looks into a puddle where he can see a reflection of himself and his mask. He thinks back to Tony Stark telling him, “If you’re nothing without this suit, then you shouldn’t have it.” The words ring loud in his head. Peter realized that fancy missions didn’t define who Spider-Man was. Moments like this do. He begins to raise the debris above his head and starts by saying, “Come on Peter, come on Peter.” When he reaches the climax, he’s saying, “Come on Spider-Man, come on Spider-Man.” It’s up there for me with the train sequence in Spider-Man 2. Truly a great moment for this version of Spidey. Now, my only complaint here. Instead of showing Tony, you know who they should have shown in a flashback? Uncle Ben. I know this film wanted to go a completely different route, but not even mentioning Uncle Ben seems weird to me. Peter doesn’t become who he is as a hero without Ben’s influence. That mini monologue he gave Tony in Civil War sounded like it came directly from the mouth of Uncle Ben. Homecoming is an interesting movie because it shows Peter getting away from the values his uncle’s death taught him. During his weakest moment, when he needed to show the most strength as Peter AND Spider-Man, I needed to see Uncle Ben there, not here Tony Stark’s voice. It is still a great scene but I don’t like Ben not even being the main inspiration for Peter getting out of that situation. Also, fun fact, that moment is from the comics as well. The end of the movie wraps up soon after that. Spider-Man stops Vulture and actually saves him from dying when the core of his weapon was reacting with the arc reactors from the plane. Spidey delivers him to the police and Vulture is arrested. Liz and her family are forced to move because of her father’s crimes, and Vulture meets another Spider-Man villain, Scorpion, in jail. The movie ends with Peter walking with Tony around the new Avengers facility. He offers Peter a chance to join the Avengers and even offers him a new suit. The suit was beautiful and appeared to be a bigger upgrade from his previous suit. Peter, after going through everything he just did with Vulture, declines. He says he needs to be the ground guy for them. Once again, here would have been a perfect time for him to mention Uncle Ben in some capacity. But, Peter leaves and finds his upgraded suit on his bed, a gift from Tony. As he’s trying it on and walking around in it, the movie ends with Aunt May staring at him in the doorway, realizing he’s Spider-Man. This film was great. It gave us a different Spider-Man story without retreading old tropes. Once again, I didn’t need to see Uncle Ben’s death, but he did need to be mentioned in this film. Still, everything about this film was great. Tom Holland is our new Spidey and will be for years to come. The supporting cast was fun as well. Ned stole the show though. His friendship with Peter felt extremely authentic. All Ned wanted to be was the “guy in the chair,” and he was just a likable character overall. Michelle, or should I say MJ, was good too. The connection between her and Peter is small right now, but I cannot wait to see them involved later on, especially since Zendaya and Holland are good friends outside of the film. Their chemistry is going to be great. Shocker was okay. The first one was killed by Vulture by mistake and the second one was serviceable. Vulture though, is probably the best MCU villain right next to Loki. His motivations are clear, they’re understandable and Keaton delivers a great performance. I wish Aunt May was in this film a bit more, but the time she was in it was good. My main negatives in this film was the effects. At least four times, I found myself wondering how a film from 2004 could look better than a film in 2017. Too many times some of the visuals looked like a video game, not a movie. It didn’t happen that much, but enough that I needed to put it in this review. PS. This movie was diverse. I loved seeing so many brown people walking the streets of New York. Black, Arab, Muslim, Hispanic, there was so many different people in this film. One of his teachers was Hispanic and the Principal was Asian. Both of his love interests are black. Well, Liz was mixed, but it counts. Best friend was Asian, and African student was on the Decathlon team, diversity was everywhere. Props to Marvel Studios for showing so many different people in this film. Enjoy this review? Think the film was perfect or think it was trash? Let me know in the comments and remember to follow me on Twitter @Hero_Review. This week is a big one as my most anticipated movie of the summer comes out. I’ll be reviewing Rise and Dawn this week, giving my thoughts on those two classics. Until next time, everyone. Peace, Love, and Comics! I just saw this tonight and absolutely loved it. I would agree with your verdict of 9/10!